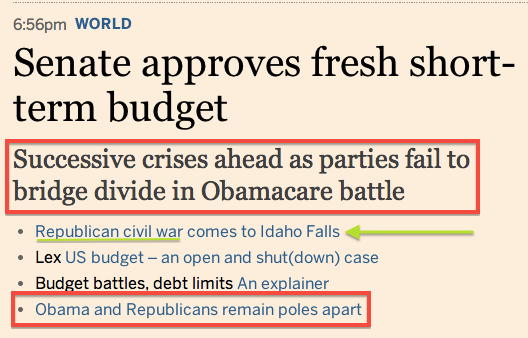 A few hours ago I suggested a primer for media coverage of the impending budget and debt-ceiling votes. Main point: the real reason we're contemplating another government shutdown and debt-ceiling crisis is the titanic struggle within one party, the Republicans, rather than the normal tussles between parties in familiar R-vs.-D mode. Therefore any story that sheds light on the varying factions and interests within conservatism generally -- Paul and Cruz and Rubio and Cantor and DeMint; Boehner and Rove and McConnell and the Kochs; Hannity and Limbaugh and Ailes; Newt and Jeb Bush and Kristol; plus whoever else -- helps us understand what's happening. And any story that presents this as a normal "both sides are to blame" recurrance of bipartisan gridlock, or as the object of rational-actor negotiation between Obama/Reid on one side and Boehner/McConnell on the other, says more about journalists' reflexive fear of not seeming even-handed than about the reality we should be trying to describe. Idaho Falls lies more than 2,000 miles from Washington. But a local political fight that has gripped this community explains in large part why the US is once again teetering on the edge of a government shutdown and even default. Far from being a one-off phenomenon, the Idaho race shows why conservative but pragmatic Republicans like Mr Simpson, who are from districts where Democrats are almost irrelevant, have been pushed to the sidelines. Anyone who reads the story will understand that whatever the Obama and the Democrats are saying or offering is essentially irrelevant to the inner GOP drama. So the paper's headline writers are describing a world -- parties are "poles apart" and cannot "bridge the divide" -- that the same paper's reporters say no longer exists. Split-consciousness specimens like this will be great time-capsule elements to illustrate how rapidly the politics of our time is veering away from our familiar ways of understanding and describing it.